The sun hits the tent at 6:30. I stumble out of my sleeping bag and look to the west. The west doesn’t look good. There are high clouds and, behind them, the unbroken overcast presaging the 50% chance of rain that was predicted for late today and tomorrow. I’m on a high saddle on the east side of Ord because last night on my way up an unoccupied car was parked in my regular campsite on the west side. As I drive back down the mountain to the 1688 road after a quick breakfast, I guesstimate the sun may not hit there until 7:00. I have two goals this weekend--to get good images of Black-chinned Sparrow and to finally finish up my last seven rolls of Velvia, the last film I’ll ever own after three fitful years of stopping and starting along the winding road to going completely digital. Deva will be happy. Film has taken up a shelf in our refrigerator for longer than we can both remember. I have averaged a couple trips up Ord every year for maybe 20 years, never failing to hear and see Black-chinneds, but never getting the image I want. I have shots of juveniles bathing and females foraging, but I want a territorial male singing from atop an oak. Typically the males have always come in and teed-up above the 1688 road, which puts the sun behind them in the morning, or they will skulk in below me, tantalize, then dive for cover as I swing the lens around. Apparently I’ve never paid the right homage to the sparrow gods, and this morning’s sky suggests I still don’t have it right. As I set up, Black-throated Gray Warblers are "bzz-buzzing" everywhere and Bewick’s Wrens are proclaiming “See me me me me me” and doing their odd little “GIBB- et” call all around me. There are two vehicles at the 1688 entrance now, and I always wonder who, if not birders, would be up here this early in the morning. I linger near each of the two water troughs, but nothing is coming to drink or bathe, and the strong west wind is probably as good a reason as any. There is a disturbance nearby in the waist high chaparral. A Gray Vireo pops up and snatches some leaf crawling morsel, but flies off before I can get on it. As I cross the first drainage a man in complete camouflage steps out of the brush. My first thought is hunter—what season is in progress? Archery bear perhaps, but then I see camera and binoculars around his neck. A birder. But not one with whom I am familiar. He reports a Red-faced Warbler upslope and Cooper’s Hawks nest building down in the drainage. We exchange pleasantries and I continue up the 1688. A large blob at eye level in a pine tree growing up from the drainage below proves to be one of the Cooper’s. The thin sun is fading in the growing overcast, but I shoot half a roll. Maybe this is a good omen. Adult Cooper’s NEVER sit for me. The wind strengthens as the 1688 winds around the mountain to the southwest. I play the Black-chinned tape. Once. A Black-throated Gray emerges from the chaparral, frame fillingly close, fussing at something, perhaps the tape. As I ratta-tat-tat away on the shutter release, as promiscuous now with my remaining film as I have learned to be with digital, a Black-chinned whips by my right ear and buries itself in the bushes. I play the tape again, once. Nothing. But a Plumbeous Vireo pipes up high in a pine. Do Grays and Plumbeous overlap here, or have I crossed over some unperceived altitudinal gradient? Farther along the 1688, nearing a clearing where I know there is a campsite, I hear voices. As I step past the entrance, another man in full camouflage is standing beside a backpack tent, pants at his knees, urinating in front of God and everyone. I am more embarrassed than he, and pass quickly up the road without wave or greeting. Does everyone on Ord wear camouflage? A Steller’s Jay cackles in the background. At least now I have accounted for the two vehicles, so there should be no more surprises. Well, unless random gunshots would be considered a surprise. An hour spent farther up the road trying to entice Spotted Towhees to hold still with the sun behind me is punctuated by gunfire, to my unpracticed ear probably small rifle. Are these campers just plinkers or hunters? I would actually feel much safer knowing they were the latter. Oh, and the sun isn’t really behind me any more. It’s behind the overcast. But soft, even lighting works for photography too. At least that’s what I’m telling myself as the towhees and the Black-throated Grays flip around low in the chaparral, never teeing up in the wind which is now gusting up to perhaps 20 mph. Back at the first drainage, an hour later by a different route, I find the hummingbird bush. In my next life I vow to become a plant guy, but I have no label for this 20 foot high patch of greenery which has long buds burgeoning to spring fruition with tiny tufts of white, downy fluff which is being harvested by two female Broad-tailed and two female Anna’s hummers, squabbling with one another. 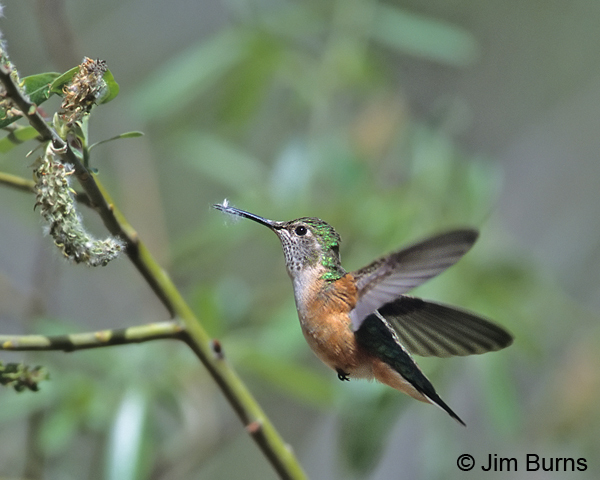 There are no males around of course, as male hummingbirds, like many males of another species we all know well, bring only one thing to the breeding cycle, and that one thing isn’t homemaking. I hold the shutter down through two rolls of film—Deva is going to be happy--hoping I get just one in-focus image. Unlikely, though, as the sun has just about lost its battle with the overcast and this is, after all, Velvia film I’m using. I hear voices and turn to see the urinator walking down the road toward me with a woman. She, too, is in full camouflage. The gun I have been hearing is in a black case, and their backpacks indicate they are leaving the area. This is three days past Virginia Tech on the eighth anniversary of Columbine and, in this context, the two figures coming toward me are slightly scary. That’s what a culture of guns can do. We exchange a greeting without incident, and I am glad to have the mountain to myself now.